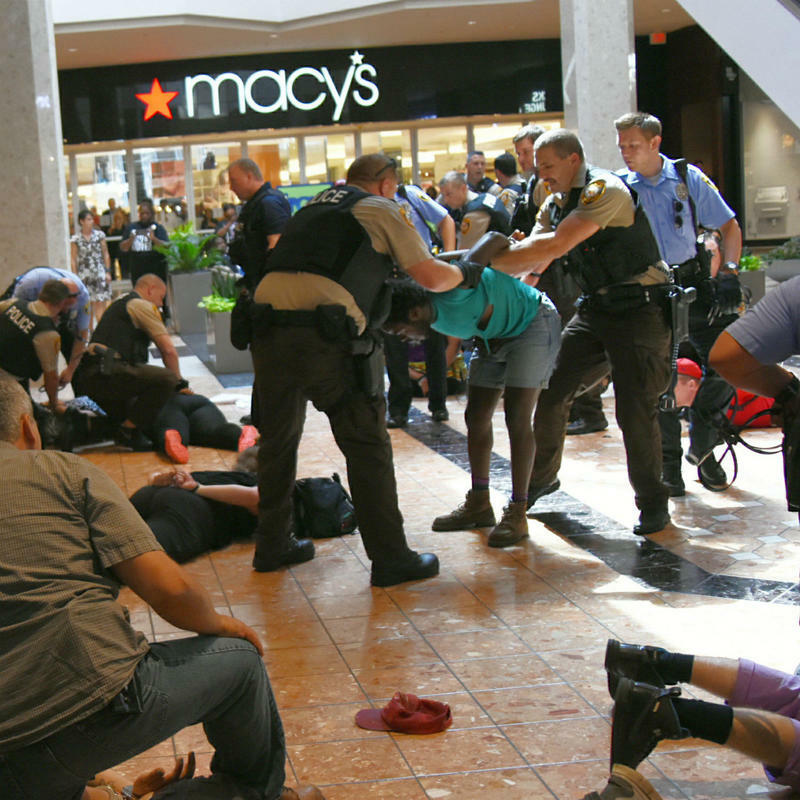 During the council meeting, speakers, including state Rep. Stacey Newman, D-Richmond Heights, contended that police used excessive force in breaking up a protest Saturday at the Galleria mall. Some told council members that they did not hear police orders to disperse. Others said they had trouble getting medicine or legal representation to people who were detained at the St. Louis County Justice Center. 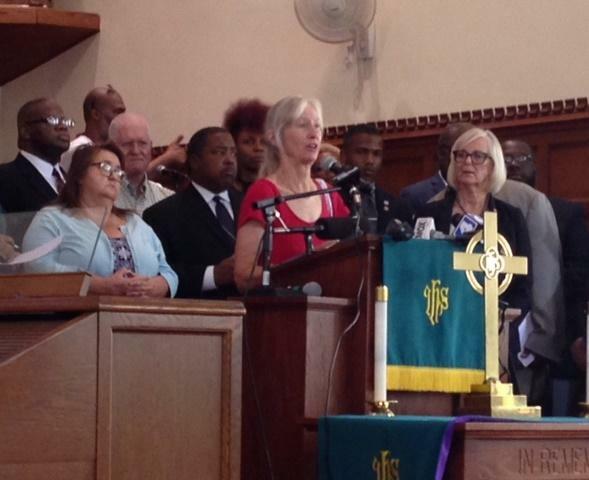 University City resident Kristine Hendrix said she was outraged by a St. Louis Post-Dispatch photograph of a police officer choking Karla Frey, an elder at the St. Peter AME Church. Frey also photographed making contact with a police officer as her grandson was being detained. University City resident Kristine Hendrix speaks Tuesday at a meeting of the St. Louis County Council. St. Louis County Prosecutor Bob McCulloch’s office charged Frye with assault in the third degree, rioting and two counts of resisting or interfering with arrest. Councilwoman Rochelle Walton Gray, D-Blackjack, said she wanted an independent entity to investigate the mall protests. The five-person St. Louis County Board of Police Commissioners oversees the county police department and can look into instances of misconduct. Councilman Sam Page, D-Creve Coeur, noted that Richmond Heights police officers were also involved in Saturday’s protests. “We have to find out who those officers are and who has jurisdiction over them,” Page said. 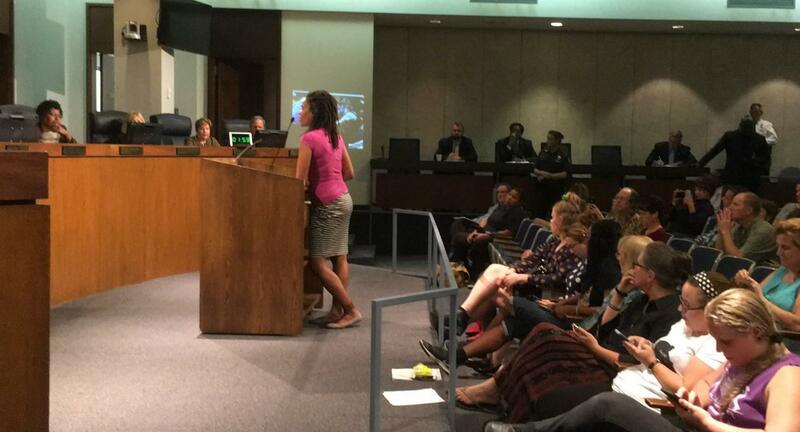 “If they’re not St. Louis County officers, then the police board … would not have jurisdiction. So, we have to answer that question first." Councilman Pat Dolan, D-Richmond Heights, said the police board can adequately look into any wrongdoing from the St. Louis County Police Department. At the same time the St. Louis County Council heard from people about their concerns, protesters gathered again downtown and took the demonstration to Busch Stadium where the Cardinals were playing the Chicago Cubs. The protesters chanted “No justice, no baseball!” and were blocked by a line of bicycle police on Clark Street between the stadium and Ballpark Village. Police eventually ordered the protesters to disperse, saying the protesters were on private property and couldn’t demonstrate there. The protesters continued to march around downtown St. Louis for another few hours while police monitored from a distance. The demonstrators blocked intersections while chanting their message, which included the call for interim Police Chief Lawrence O’Toole to step down.